Due to the outbreak of social disobedience and subsequent violent confrontation with police, this week the world is focusing on Linshui, a small city in the southwestern province of Sichuan. Since 16 May, tens of thousands of residents of Linshui gathered, demanding that a proposed high-speed railway linking Dazhou to Chongqing pass through their county, enabling business opportunities and convenience. However, the authorities planed for the railway to arc more than 200km west and pass through Guang’an, the one-time hometown of the late paramount leader Deng Xiaoping. Unconfirmed reports suggest that up to four people had died and more than 100 were injured due to violent confrontations between marchers in Linshui and police. In this essay, we want to focus on the regional context. Whilst foreign attention to China’s periphery has tended to focus on obvious sites — the endemically “restive” northwest, the occasionally-flaming sprawl of ethnographic Tibet, or the perpetually looming “crackdown” on refugees on the border with Korea — the Han parts of Sichuan are also possible hotspots of trouble for the central government. Indeed, the Southwest as a whole continues to be problematic in its relationship to the centre, and decisions made in the 1997 (the creation of the Chongqing municipality) and the 1950s are still impacting how local residents view national policy. One proverb is particularly apropos to this situation: “Want to be rich? Build roads first!” (yaoxiang fu, xian xiulu/ 要想富，先修路). While the rhyme may sound fanciful, the expansion of the high-speed rail is taken with great seriousness in China, and its absence has stimulated several demonstrations in rejected counties before. We believe that these protests should of course be interpreted within their national context – protesters are, in a sense, expressing concerns that could be and have been expressed in any other part of China. From East China (Dengzhou and Xinye, two adjacent counties in Henan Province), to the Central China (Shaoyang and Loudi, two adjacent counties of Hunan Province), and now to the Southwest, people protest in order to express their desire to join the high-speed rail network. As the PRC pushes massive propaganda campaigns about “Silk Roads” of prosperity stretching to nearly infinity (or North Korea), it would be impossible for citizens anywhere to be ignorant of the advantages that could be gained from joining the network. The Southwest was designated one of the “great regions” in 1949, and the “Xibu dakaifa” (Develop the West) campaign was supposed to have brought great infrastructural gains to the region. The economies in Chengdu and Chongqing have done extremely well – they are now overcrowded monuments to ambition, unending mass transit construction, automobile traffic jams, foreign investment magnetism, and manufacturing prowess. 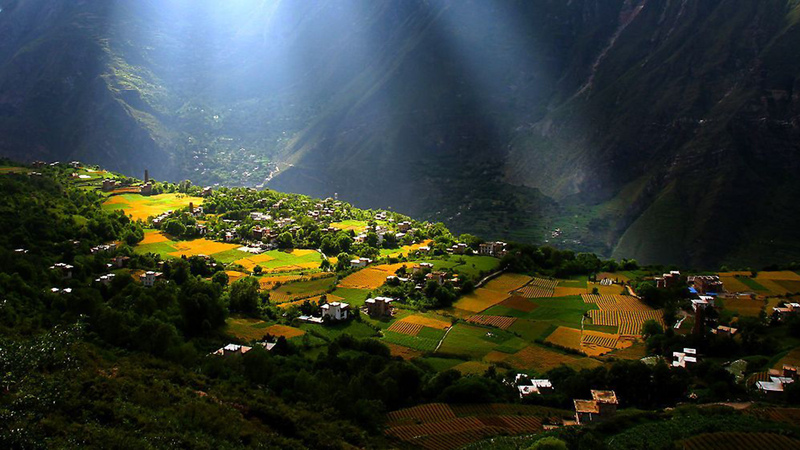 The rural areas of Sichuan and around Chongqing (the latter was split off as a special administrative city in 1997) have fared less well, as can be easily recalled in the Wenchuan earthquake, areas of Tibetan majority in Xikang, and the valleys around Chongqing. For the resident of Linshui, it is therefore a simple matter to look around and see other communities thriving. Chongqing includes a large number of rural communities in its 29 million people, but Linshui is not one of them. Linshui locals require more than two hours of high-speed road driving to Chengdu but less than an hour to Chongqing. In terms of the all-important dialect, Linshui is also much more closer to Chongqing than Chengdu. Nearby Guang’an clearly has more propaganda value from the standpoint of the central government. In 1996, when the Central Committee was discussing the dimensions of the city district of the new special administrative Chongqing, Li Peng, then the Premier of the PRC, disagreed with the plan that put Guang’an (including Linshui County) as one part of Chongqing. One of the reasons is that Deng Xiaoping always said, “I am a Sichuanese” – how could the CCP honor Deng if his hometown were pulled into Chongqing’s orbit so explicitly? The other reason was that Guang’an had many poor counties like Linshui around it, and the population for Chongqing was already huge. Li Peng said “small horses pull a huge carriage”(xiaoma la dache/ 小马拉大车). In other words, counties needed to serve the goals of urban areas. As “a small horse,” Linshui’s development in terms of GDP was far behind that other counties in Sichuan or Chongqing, so it would add little to the statistical bonanza that the new Chongqing boundaries was meant to create. Meanwhile, Chongqing has fewer and fewer problems getting what it needed. As a port city connecting the Jialing and Yangtze Rivers, it could attract sufficient attention from the center. Much like the gangs on the Chaotianmen wharf controlling the port management in the ancient time, city bureaucrats could get what they needed. Linshui’s perpetually peripheral status means that their inhabitants obviously feel left out of China’s transportation boom and its economic benefits. Looking even further back at the history of the Southwest in the consolidation period of the PRC risks taking on an obscure analytical lens, but in fact, many of the issues remain the same. Recent CPI writing about Sichuan has mirrored broader media trends, in that its analysis of the province has tended to fixate on big personalities. When the personalities involved are Bo Xilai, Zhou Yongkang, and a security chief who smuggled himself into the US Consulate in Chengdu in the boot of a car, Wang Lijun, it would be foolish to argue that such writing is not significant, or has little bearing on the future of the PRC; quite the opposite! Ever since Sidney Rittenberg telegraphed Bo’s fall in a New York Times interview in November 2009, this metastasizing factional and internal struggle has been a driver of both narrative and policy. But beyond these ‘bangpai’, and the colourful trials of Chongqing gangs which happened from 2009 to 2011, we can recall a history of southwestern corruption and difficulty in relations with the central government. Sichuan’s unique history has left particular scars amongst the population when it looks to Beijing. Even very young people without personal experience of the Mao years can easily connect to family histories. During the Cultural Revolution (1966-1976), the province was among the most violent in terms of Red Guard factions and reprisals. Looking further back, Sichuan, of course, was a Guomindang stronghold from 1938-1946. It was not coincidental that Jiang Jieshi’s last weeks on the mainland in November and December 1949 were spent not in Fujian, but in Chengdu. Judging from the rather extensive paper trail recently revealed in the December 2013 publication of Volume 1 of his revised and expanded Nianpu, Mao was extremely sensitive about consolidating the broader southwest. The Sichuan People’s Government was set up in early 1950, and the Land Reform Movement was started quite late. As the CCP extended its control over the region’s land and grains, Sichuan became a high-producing area during the First-five Year Plan. From 1953-1958, Sichuan harvested 10 billion kilograms of grains, and 8.1 billion kilograms were transported to other regions. In other words, about 70% of the allocated grains were transported out of Sichuan province by the Yangtze River and 60% were transshipped at Chongqing. Once the famine began during the Great Leap Forward, scholars like Chris Bramall and Cao Shuji indicate, Sichuan’s death rate was among the highest nationally. The Southwest as an area has a unique local history and a multiplicity of nationalities, and when looking at it, we need we pay more attention to collective experiences there and not just high-powered individuals or corruption cases. The protesters in Linshui have a strong memory of local history, and have experienced a sharp contrast in comparison with surrounding counties in the contemporary era. Because the CCP will continue to deploy physical repression mixed with media censorship, it seems that protests are unlikely to spread from Linshui. But there is cause for concern, and looking back at the legacy of central-peripheral relations in Sichuan since the founding of the PRC might yet yield lessons.